Although the hands of time cannot be completely turned back, facial rejuvenation can slow down or even reverse some of the natural aging processes which produce lines and wrinkles, age spots, broken capillaries, dull skin, and uneven tone and texture. Other ﬂaws include loss of collagen and elastin, resulting in sagging skin, gaunt faces, dark circles and puﬃness under the eyes. Open pores and acne scars also appear more visible. Relax: refers to using anti-wrinkle injections which so often wrinkles caused by muscle movement. The facial muscles of expression, if used too much, can result in “frown lines” between the eyes, “worry lines” of the brow or “crow’s feet” beside the eyes. By relaxing the muscles responsible for these expressions, we are able to interfere with the development or progression of such lines. Reﬁll: various products, from ﬁllers to one’s own fat, can be used to address facial volume loss. Such techniques are used in the treatment of deeper wrinkles, folds and expression lines that are too deep to be adequately aﬀected by resurfacing. Resurface: refers to methods that remove the outer layers of the skin to yield a smoother, more even-coloured texture. These techniques are used to treat sun-damaged, weathered, or aged skin. These are useful for dealing with wrinkling of the skin, blotchiness, roughness and loss of lustre e.g. facials, microdermabrasion, chemical peels, and lasers. Redrape: refers to traditional surgical interventions that improve areas of redundant skin. Overtime and with accumulated sun damage, the skin loses its elasticity and may begin to sag. This is especially true in the lower face and neck although laxity of the brow skin and eyelids is also common. Most treatments for signiﬁcant sagging of the face require surgical interventions e.g. facelifts, brow lifts, eyelid lift surgery. Removal: It is not uncommon to develop unwanted bumps, broken blood vessels, brown spots or tags on the skin, especially on the face and neck. All of these can be treated by simple removal techniques. In many cases, liposuction (removal of fat) can tighten the neck adequately without actually removing skin surgically. Today, in the ﬁeld of cosmetics, reﬁll is much more appreciated in our approach to facial rejuvenation. Temporary ﬁllers like hyaluronic acid (HAs) are considered the gold standard. Fillers are often combined in diﬀerent areas of the face to recreate youthful contours, sometimes referred to as a “liquid facelift.” My go-to ﬁllers for correcting hollows under the eyes, cheekbones or lips are HAs or fat. Vertical lip lines are treated with a combination of HAs and anti-wrinkle injections or laser resurfacing. Fat transfer can be used to replace volume in most areas of the face including the temples (a much-neglected area until recently), cheeks, jawline, nasolabial folds, and marionette lines. It gives reliable, natural-looking results, and even improves the texture of the skin. Fat transfer is an easy, economical, safe, and comfortable means of volume replacement for the face. Fat is harvested from an area of excess fat such as the hip, thigh, or abdomen. The fat is then processed and placed in small amounts to resculpt the facial contours of the face. Fat transfer is usually done under general anaesthesia. Fat is also an excellent choice for rejuvenating the hands, as it camouﬂages the appearance of visible tendons and dilated veins. There are so many choices available for skin and facial rejuvenation. One can create a natural and gradual volume replacement. The “cookie cutter” approach to ﬁllers is out. 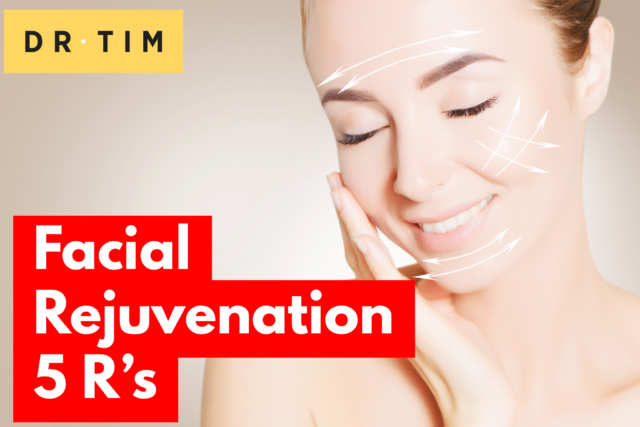 Discussing the 5 Rs and how the various techniques are used in combination for skin and facial rejuvenation can aide in maximising outcomes. Question: What signs of facial aging trouble women the most? You can leave a comment below.